The Visual Resources Center (VRC) currently holds more than 50,000 digital images and 130,000 35mm slides. Our image collections include works of art and design, buildings, cities and cultural objects from pre-history to the present day. The Visual Resources Center is a campus-wide resource for the use of visual materials in teaching and research. 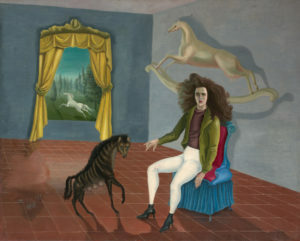 Bard Faculty may place orders for course related digital images. All images ordered through the VRC will be included in our Institutional Collection which is accessed through the Artstor Digital Library. Whenever possible, the VRC will purchase requested images from commercial vendors. When images are not readily available for purchase, the VRC will produce digital images in-house from high quality books and journals. See Image Orders for more information. The Visual Resources Center provides support and training to faculty and students who wish to use Omeka, a collections-focused web publishing platform. 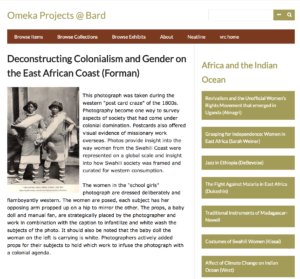 Omeka can be used to share primary source collections and collaborate with others in the creation of digital exhibitions. Neatline is a plugin for Omeka that allows you to create exhibitions that are map-based. Neatline can be used in conjunction with Omeka or as a standalone platform; it utilizes a variety geo-temporal tools including waypoints, annotations and timelines. For more information on Omeka or Neatline, please contact Amy Herman. Training is offered on an individual basis by appointment.